It was Mexican night last night and we had one of our regular dishes, spinach enchiladas. They were one of my first successful vegetarian Mexican dishes. I’d been looking for a good Mexican cookery book for a while and I was in America with work when I found a little bilingual (English and Spanish) book by a Taiwanese publisher called Mexican Cooking made Easy. It doesn’t have a lot of vegetarian dishes in it but this was the first one I tried and it hit the spot. I’ve lost count of how many times I’ve cooked it but haven’t yet tried anything else from the book. The enchilada sauce is really easy but very tasty so I’ve listed the ingredients and instructions separately in case you want to make it to use in other dishes. Unlike most sauces where you start off frying some of the ingredients, in this one you just put everything in a pan and cook it and it really does have a good flavour. The filling is simple too, just a mix of cooked spinach, grated cheese and raw, chopped onion. Because the onion isn’t cooked first it retains a bit of a crunch and a distinctive flavour even after the enchiladas are cooked. I like this but if you particularly dislike raw onions you might want to fry them to soften them first or use red onions which are usually a little bit sweeter and milder. The recipe specifies corn tortillas and that’s what I usually use though I have made them with wheat tortillas when I’ve got mixed up in the supermarket and they’ve still been good. I’ve specified that this recipe serves 3 but it would definitely stretch to 4 if you served it with some salad and maybe rice. Also you could stretch the filling between 8 tortillas which is what you usually get in a packet anyway. If I do have leftover tortillas I freeze them and then use them up for wraps or quesadillas (sandwich peppers, mushrooms, etc, and grated cheese between two tortillas and cook gently on both sides in a frying pan until the cheese melts). Put the passata, chopped onion, chilli powder or chipotle paste, paprika, salt, cumin, oregano and garlic into a saucepan and stir while bringing to the boil. Stir in the grated cheese and simmer for a further 10 minutes, stirring occasionally. Heat the oven to 180°C/gas mark 4. Put the spinach in a large pan with a small amount of boiling water. Cover and boil for 2-3 minutes until the spinach wilts down. Drain, squeeze out some of the excess liquid and chop. 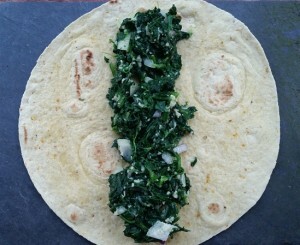 Mix spinach, onion and 75g of the cheese. Divide the filling between the 6 tortillas, placing it in a strip down the middle. Put a thin layer of enchilada sauce in the bottom of an oven dish that will hold the enchiladas in a single layer. 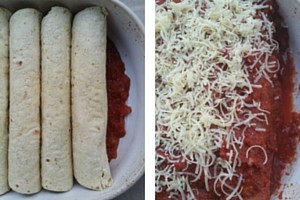 Roll the tortillas around the filling and line them up in the dish. Cover with the rest of the enchilada sauce. 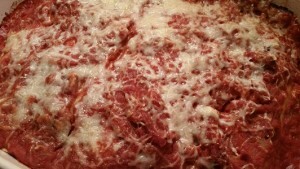 Sprinkle with the rest of the grated cheese.